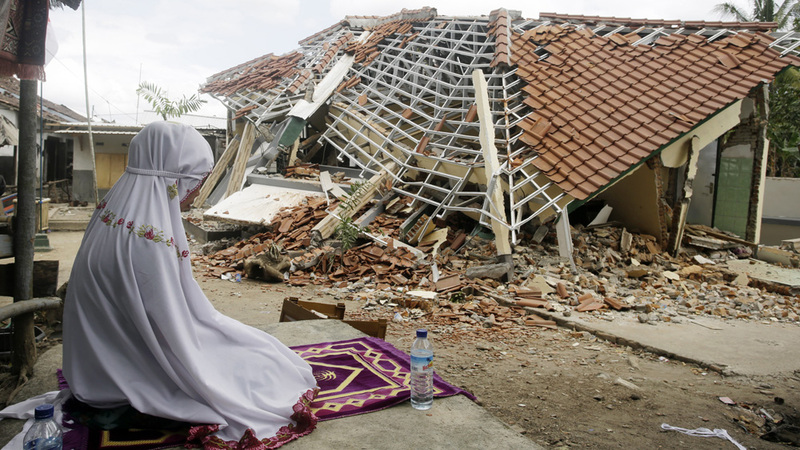 Multiple strong earthquakes have killed at least a dozen people on the Indonesian islands of Lombok and Sumbawa as the region tried to recover from a quake earlier this month that killed hundreds of people. A shallow magnitude-6.9 quake that hit at 10pm local time (14:00 GMT) was one of several powerful earthquakes on Sunday in the northeast of Lombok that also caused landslides and was followed by strong aftershocks. At least 10 people on Lombok and Sumbawa island were killed by collapsing buildings or heart attacks, according to National Disaster Mitigation Agency spokesperson Sutopo Purwo Nugroho, who added that at least 24 people were also injured. Power was out across Lombok after the quake, making it difficult to assess the extent of the damage, Nugroho said earlier. At least seven aftershocks were recorded. More than 1,800 homes were damaged, at least half of them severely, he said. Two people died earlier on Sunday on Lombok during a magnitude 6.3 quake. The swarm of quakes caused panic in Sembalun subdistrict on Lombok in the shadow of Mount Rinjani, but many people were already staying in tents after the deadly jolt in early August and its hundreds of aftershocks. Aftershocks ranging between magnitude 4 and 5 were continuing on Monday morning and access to some areas had been cut off by landslides triggered by the tremors, according to officials in Mataram, Lombok’s main city. “The population feels like it’s had the rug pulled from under them with this new quake,” said Caroline Haga, humanitarian & emergency communications specialist with the Red Cross. Sunday night’s tremor occurred on a different fault and was not an aftershock of the magnitude-7 quake on August 5 that killed 460 people, damaged tens of thousands of homes and displaced more than 350,000 people. Authorities estimate that the August 5 earthquake caused five trillion rupiahs ($348m) of damage on Lombok. Quakes earlier on Sunday caused landslides on Rinjani, an active volcano. Rinjani has been closed to visitors following a July earthquake that killed 16 people, triggered landslides and stranded hundreds of tourists on the mountain. Indonesia, a sprawling archipelago that straddles the so-called Pacific “Ring of Fire” in the Pacific Ocean, is prone to earthquakes and volcanic eruptions. In 2004, a tsunami triggered by a magnitude 9.3 undersea earthquake off the coast of Sumatra, in western Indonesia, killed 220,000 people in countries around the Indian Ocean, including 168,000 in Indonesia.